At College Now, we have long been known for working with traditional students on their paths to postsecondary attainment. However, we have also developed a robust program to help another population that needs our services – adult learners. An adult learner, according to College Now, is anyone 19 or older who has had their education interrupted for one year or more. And, in northeast Ohio, these are the individuals who can help change our community by taking the next step in their postsecondary journeys. Currently, northeast Ohio employers have openings for skilled workers – but not enough people are obtaining the degrees or credentials to meet employers’ needs. Beyond the immediate needs, of course, is the fact that, by 2020, over 60% of jobs will require some kind of postsecondary credential. The 440,000 adults in Cuyahoga County ages 25 and over whose highest level of educational attainment is a high school credential or “some college, no degree,” are a critical piece to the educational attainment puzzle and probably have 440,000 different situations that have kept them from pursuing that continued education. These adults are parents, or children of elderly parents. They have houses to maintain and bills to pay. Some may even have student loan or other debt from previous attempts to complete a degree. Most of these adults are employed, though many may not be earning a living wage (which, in Northeast Ohio, is $21/hour to support one adult and one child [Massachusetts Institute of Technology, Living Wage Calculator, 2016]). 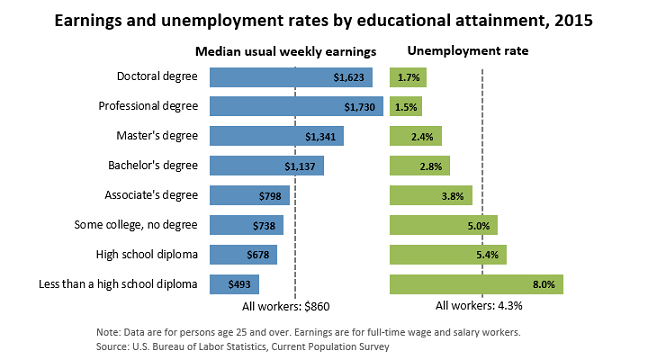 As you can see in the graphic below, an employee cannot reach that living wage without a bachelor’s degree. Of course, it isn’t always easy to reach that living wage threshold if you’ve been out of the postsecondary game for a while. 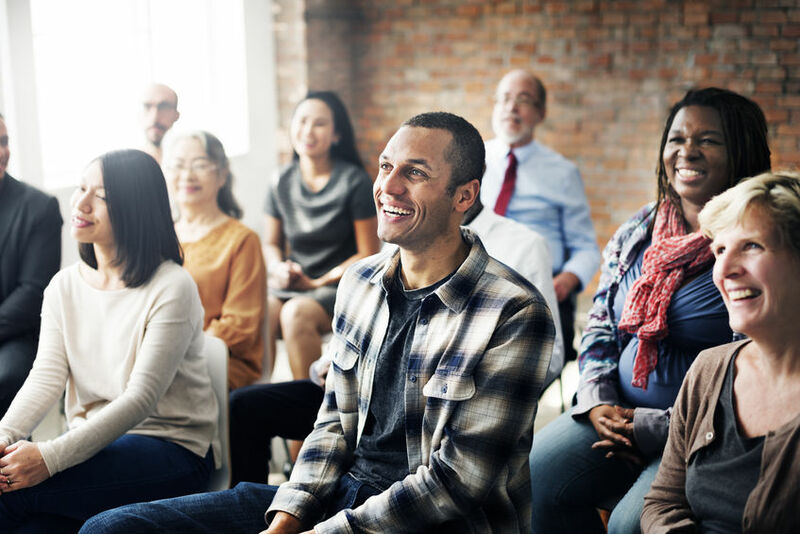 The idea of going back to school may be daunting, and many adults may not relish the idea of being in a program with older teenagers. However, what you might think of as the “average” college student isn’t so average anymore, and adults returning to school are becoming more and more common in recent years. In 2011, The Atlantic reported that thirty-eight percent of undergraduates were over the age of 25 and one-fourth were over the age of 30. Further, the number of students who are over age 25 is projected to increase another twenty-three percent by 2019. At College Now, we know that assimilating into higher education can be challenging for adults. That’s why we have advisors who are uniquely trained to help adult learners find the school and program that is the right fit for them individually. We work with adults to determine what sort of degree or credential they need to obtain a job in the field they desire. We understand that there is not a “one-size fits all” model for our work with adults, and we are prepared to understand what exactly they need to take the next step toward educational attainment. We also understand that funding is often a concern for adults going back to school – whether it’s how to make school fit into a current budget, or how to work student loans into a future financial plan. Our Adult Learner Scholarship has a rolling application and is open to adults 19 and over who have discontinued their education for more than one year and are residents of the following Northeast Ohio Counties: Ashtabula, Cuyahoga, Geauga, Lake, Lorain, Mahoning, Medina, Portage, Stark, Summit or Trumbull. More information can be found on our website. Additionally, College Now helps adults get their finances in order after graduation with student loan counseling. Our advisors help students decide which repayment plan best fits their budget, and can help lower monthly payments to make loan debt affordable. Increasing educational attainment among adults is not just a “nice” thing to do. It is imperative to our local economy that more residents obtain degrees that will qualify them to fill the present and future jobs. The positive effects that increased educational attainment can have on a community are numerous. Cuyahoga County’s economic health depends on educational attainment being a top priority for the community’s working adults.